Most of you would probably balking at the thought of riding such a small plane. I’ve ridden on Seair’s Let-410 several times and hey, I’m still alive :P Riding on a small airplane isn’t so bad, really. During the first few times I’ve ridden the Let-410, I get terrible ear pressure problems. However, once I’ve gotten the hang of dealing with my ear pressure problems (decongest before your flight! ), flying has been pain-free. The beauty of flying on a small aircraft is its ability to land on small airports not usually served by larger planes. El Nido is one of the destinations not commonly found in other airline’s route map. 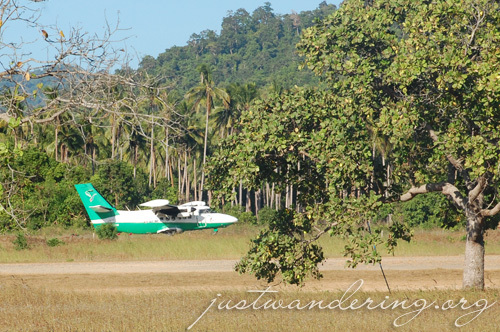 Flying into El Nido is the easiest and fastest way to get to the gorgeous beaches. Flying time from Manila is only 1 hour and 20 minutes. 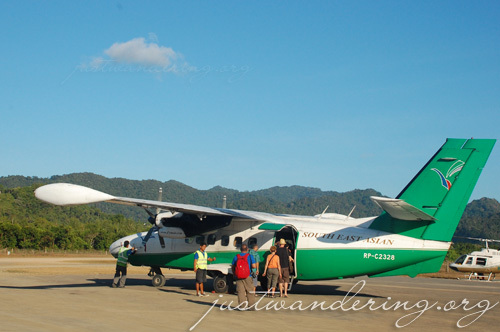 Currently Seair is offering twice a week flights to El Nido. Come April 14, flights will be every Wednesday, Sunday and Monday. This schedule will only be until June 30, 2010. To purchase tickets to El Nido visit www.FlySeair.com or call (+632) 8490100. For packages call SEAIR Leisure Escape Packages at (+632) 8437308. Seair is celebrating its 15th year of service with a Lean Season promo! Boracay one-way tickets can be purchased for as low as PhP 1,235 ++ per way and Batanes one-way tickets for as low as PhP 2835 ++ per way for travel from June 16- October 15, 2010. The selling period is up to May 15, 2010 but the promo is for limited seats, so interested holiday makers are advised to book early to get a better chance of availing the special rates. What’s something I won’t forget with a Let-410 is getting weighed along with my small backpack at check-in counter before boarding the aircraft. Nakakailang ano? Haha, yes! Ayan lang talaga ang ayoko sa LET-410! Nina, I just wanted to drop a line to let you know that I find your blogs so helpful. Step-by-step, thoroughly-researched, and very much well-written. Allow me to thank you! I’d subscribe na, so I won’t miss any of your travel tips.